The college expanded its Career Fair to a two-day, two-location event in order to accommodate the surge of employers recruiting “tomorrow makers” from the school’s 100-plus diverse majors. More than 450 employers – including 29 Fortune 500 companies – networked with students in the college’s Field House and Bardo Gymnasium, offering 5,000-plus jobs and internships. 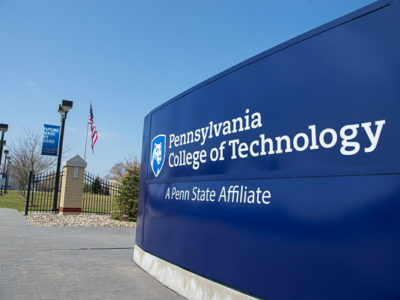 The Spring 2019 Career Fair attracted more than 450 employers – including 29 Fortune 500 companies – to Pennsylvania College of Technology’s Field House (shown here) and Bardo Gymnasium. Employers were offering 5,000-plus jobs and internships. Aaron Holdren knows that firsthand. He boasts two degrees from Penn College – a bachelor’s in manufacturing engineering technology and an associate in toolmaking technology – and returned to campus recruiting for his family’s business: Holdren Precision Machining in Ulster. Robert Welton, director of human resources for the Plastek Group, has used Penn College to inject youth into the Erie-based custom plastics manufacturer for several years. The total Career Fair pipeline consisted of approximately 1,400 students. No matter their major, the students appreciated the opportunity to build rapport with potential employers. Shannon R. Stevens, a dental hygiene student from Williamsport, expressed gratitude for meeting with representatives from Capitol Dental Care, of Harrisburg. Wyatt C. Case, an on-site power generation student from Mansfield, and Carl L. Dinger, an electrical technology major from Columbia Cross Roads, have experienced the “real world,” thanks to summer internships secured at past Career Fairs. Both said they have full-time job offers from the companies they interned with, and they were using the latest Career Fair to explore all options. NACE’s 2018 Internship & Co-op Report found that the average conversion rate from intern to full-time hire was 45.6 percent. Senior industrial design majors Nicole Bamonte, of Williamsport, and Abigail M. Meredick, of Danville, don’t have full-time job offers but were confident the Career Fair would enhance their employment possibilities. The college will host its next Career Fair in the fall.